T LAST THE people of Israel came into the promised land, but they did evil in the sight of the Lord in worshipping Baal; and the Lord left them to suffer for their sins. Once the Midianites, living near the desert on the east of Israel, came against the tribes. The two tribes that suffered the hardest fate were Ephraim, and the part of Manasseh on the west of Jordan. For seven years the Midianites swept over their land every year, just at the time of harvest, and carried away all the crops of grain, until the Israelites had no food for themselves, and none for their sheep and cattle. The Midianites brought also their own flocks and camels without number, which ate all the grass of the field. The people of Israel were driven away from their villages and their farms, and were compelled to hide in the caves of the mountains. And if any Israelite could raise any grain, he buried it in pits covered with earth, or in empty winepresses, where the Midianites could not find it. "O, Lord, how can I save Israel? Mine is a poor family in Manasseh, and I am the least in my father's house." And the Lord said to him: "Surely I will be With you, and I will help you drive out the Midianites." Gideon felt that it was the Lord who was talking with him, in the form of an angel. He brought an offering, and laid it on a rock before the angel. Then the angel touched the offering with his staff. At once, a fire leaped up and burned the offering; and then the angel vanished from his sight. Gideon was afraid when he saw this; but the Lord said to him: "Peace be unto you, Gideon, do not fear, for I am with you." On the spot where the Lord appeared to Gideon, under an oak tree, near the village of Ophrah, in the tribe-land of Manasseh, Gideon built an altar and called it by a name which means: "The Lord is peace." This altar was standing long afterward in that place. Then the Lord told Gideon that before setting his people free from the Midianites, he must first set them free from the service of Baal and Asherah, the two idols most worshipped among them. 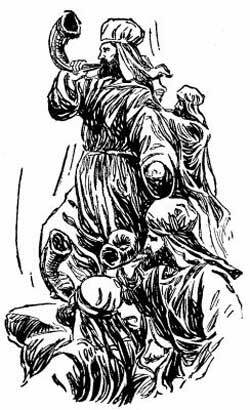 Near the house of Gideon's own father stood an altar to Baal, and the image of Asherah. On that night, Gideon went out with ten men, and threw down the image of Baal, and cut in pieces the wooden image of Asherah, and destroyed the altar before these idols. And in its place he built an altar to the God of Israel; and on it laid the broken pieces of the idols for wood, and with them offered a young ox as a burnt-offering. On the next morning, when the people of the village went out to worship their idols, they found them cut in pieces, the altar taken away; in its place an altar of the Lord, and on it the pieces of the Asherah were burning as wood under a sacrifice to the Lord. The people looked at the broken and burning idols; and they said: "Who has done this?" Some one said: "Gideon, the son of Joash, did this last night." "We are going to kill your son because he has destroyed the image of Baal, who is our god." And Joash, Gideon's father, said: "If Baal is a god, he can take care of himself, and punish the man who has destroyed his image. Why should you help Baal? Let Baal help himself." And when they saw that Baal could not harm the man who had broken down his altar and his image, the people turned from Baal, back to their own Lord God. Gideon sent messengers through all Manasseh on the west of Jordan, and the tribes near on the north; and the men of the tribes gathered around him, with a few swords and spears, but very few, for the Israelites were not ready for war. They met beside a great spring on Mount Gilboa, called "the fountain of Harod." Mount Gilboa is one of the three mountains on the east of the plain of Esdraelon, or the plain of Jezreel, where once there had been a great battle. On the plain, stretching up the side of another of these mountains, called "the Hill of Moreh," was the camp of a vast Midianite army. For as soon as the Midianites heard that Gideon had undertaken to set his people free, they came against him with a mighty host. "O Lord God, give me some sign that thou wilt save Israel through me. Here is a fleece of wool on this threshing floor. If to-morrow morning the fleece is wet with dew, while the grass around it is dry, then I shall know that thou art with me; and that thou wilt give me victory over the Midianites." "O Lord, be not angry with me; but give me just one more sign. To-morrow morning let the fleece be dry, and let the dew fall all around it, and then I will doubt no more." The next morning, Gideon found the grass, and the bushes wet with dew, while the fleece of wool was dry. And Gideon was now sure that God had called him, and that God would give him victory over the enemies of Israel. The Lord said to Gideon: "Your army is too large. If Israel should win the victory, they would say, 'we won it by our own might.' Send home all those who are afraid to fight." "Whoever is afraid of the enemy may go home." And twenty-two thousand people went away, leaving only ten thousand in Gideon's army. But the army was stronger though it was smaller, for the cowards had gone, and only the brave men were left. But the Lord said to Gideon: "The people are yet too many. You need only a few of the bravest and best men to fight in this battle. Bring the men down the mountain, past the water, and I will show you there how to find the men whom you need." In the morning Gideon, by God's command called his ten thousand men out, and made them march down the hill, just as though they were going to attack the enemy. And as they were beside the water, he noticed how they drank, and set them apart in two companies, according to their way of drinking. When they came to the water, most of the men threw aside their shields and spears, and knelt down and scooped up a draft of the water with both hands together like a cup. These men Gideon commanded to stand in one company. "Set by themselves these men who lapped up each a handful of water. These are the men whom I have chosen to set Israel free." Gideon counted these men, and found that there were only three hundred of them, while all the rest bowed down on their faces to drink. The difference between them was that the three hundred were earnest men, of one purpose; not turning aside from their aim even to drink, as the others did. Then, too, they were watchful men, always ready to meet their enemies. So Gideon, at God's command, sent back to the camp on Mount Gilboa all the rest of his army, nearly ten thousand men, keeping with himself only his little band of three hundred. Gideon's plan did not need a large army; but it needed a few careful, bold men, who should do exactly as their leader commanded them. He gave to each man a lamp, a pitcher, and a trumpet, and told the men just what was to be done with them. The lamp was lighted, but was placed inside the pitcher, so that it could not be seen. He divided his men into three companies, and very quietly led them down the mountain in the middle of the night, and arranged them all in order around the camp of the Midianites. Then at one moment a great shout rang out in the darkness, "The sword of the Lord and of Gideon," and after it came a crash of breaking pitchers, and then a flash of light in every direction. The three hundred men had given the shout, and broken their pitchers, so that on every side lights were shining. The men blew their trumpets with a mighty noise; and the Midianites were roused from sleep, to see enemies all round them, lights beaming and swords flashing, while everywhere the sharp sound of the trumpets was heard. They were filled with sudden terror, and thought only of escape, not of fighting. But wherever they turned, their enemies seemed to be standing with swords drawn. They trampled each other down to death, flying from the Israelites. Their own land was in the east, across the river Jordan, and they fled in that direction, down one of the valleys between the mountains. Gideon had thought that the Midianites would turn toward their own land, if they should be beaten in the battle, and he had already planned to cut off their flight. The ten thousand men in the camp he had placed on the sides of the valley leading to the Jordan. There they slew very many of the Midianites as they fled down the steep pass toward the river. And Gideon had also sent to the men of the tribe of Ephraim, who had thus far taken no part in the war, to hold the only place at the river where men could wade through the water. Those of the Midianites who had escaped from Gideon's men on either side of the valley were now met by the Ephraimites at the river, and many more of them were slain. Among the slain were two of the princes of the Midianites, named Oreb and Zeeb. A part of the Midianite army was able to get across the river, and to continue its flight toward the desert; but Gideon and his brave three hundred men followed closely after them, fought another battle with them, destroyed them utterly, and took their two kings, Zebah and Zalmunna, whom he killed. After this great victory the Israelites were freed forever from the Midianites. They never again ventured to leave their home in the desert to make war on the tribes of Israel. After this, as long as Gideon lived, he ruled as Judge in Israel. The people wished him to make himself a king. "Rule over us as king," they said, "and let your son be king after you, and his son king after him." "No, you have a king already; for the Lord God is the King of Israel. No one but God shall be king over these tribes." Of all the fifteen men who ruled as Judges of Israel, Gideon, the fifth Judge, was the greatest, in courage, in wisdom, and in faith in God.